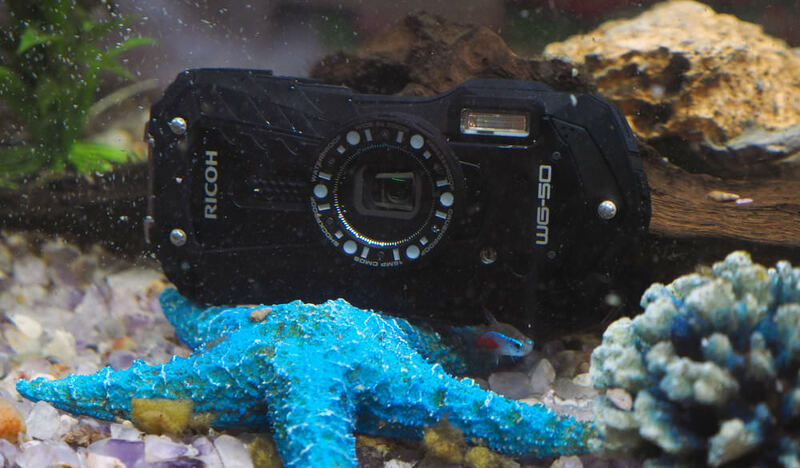 We review the Ricoh WG-50, Ricoh's latest underwater tough camera. The Ricoh WG-50 updates the WG-30 (and WG-40 which was available in some markets), with a slightly improved specification, including improved waterproofing down to 14m, and increased the shockproof rating of 1.6m. The camera has a tough design and grip, being freezeproof and shockproof, but the camera does not feature GPS, nor does the camera feature Wi-Fi. The Ricoh WG-50 is available in black or orange and features a 16-megapixel BSI CMOS sensor, and FullHD video recording. 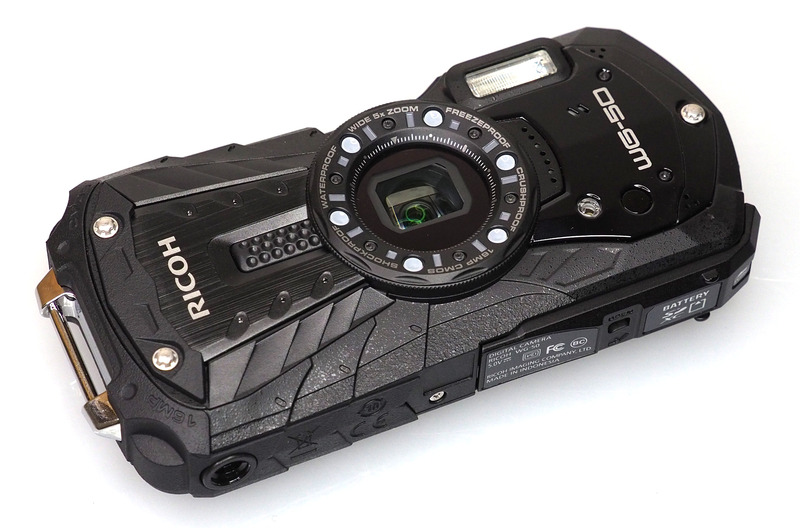 The Ricoh WG-50 features a wide-angle 5x optical zoom lens equivalent to 28mm to 140mm in 35mm terms. The camera uses digital shake reduction rather than optical and has a built-in flash for low-light situations, as well as 6 LED macro lights around the lens for close-up photos. The camera comes with a macro ring to let you place the camera directly onto flat surfaces. When shooting there is an Auto Picture mode which automatically selects the best camera settings for the detected scene. There are a number of other scene modes such as HDR, digital microscope, time-lapse and more. When you've finished shooting you can edit your pictures in playback using a range of filters. The WG-50 is waterproof to 14m, shock resistant to 1.6m, freezeproof to -10°C, crushproof, and dust-proof. Videos are recorded in Full 1080p HD at 30 fps, and you can also record high-speed videos at 120fps. 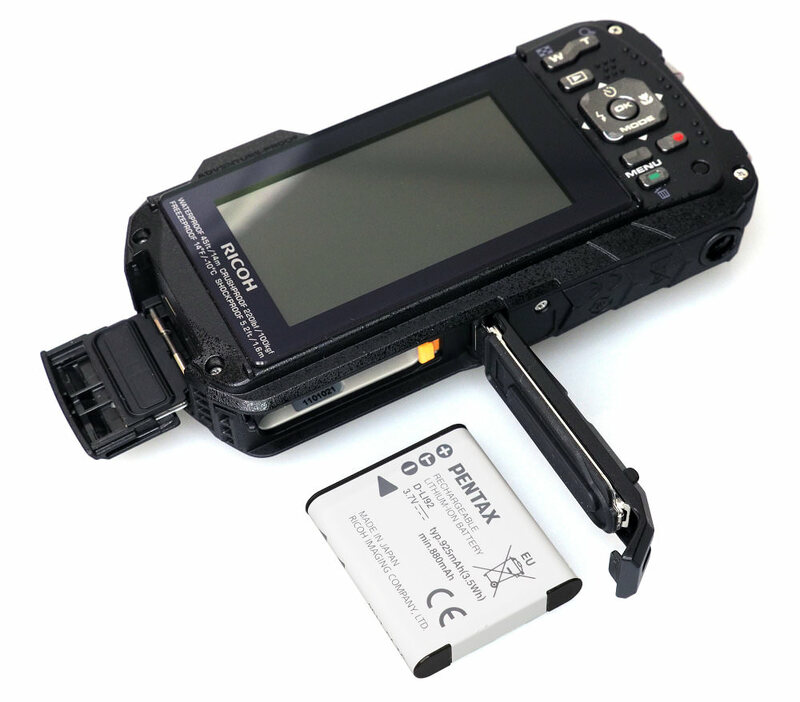 The WG-50 can be connected to an HDTV for playback via HDMI. 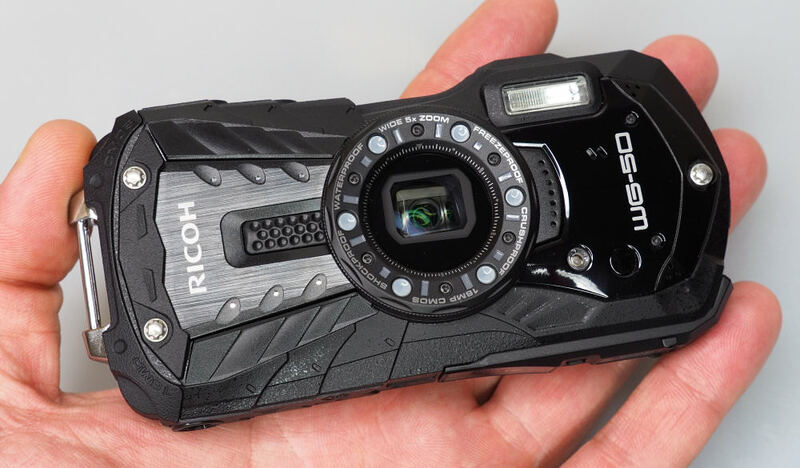 The Ricoh WG-50 has a chunky style with a number of different textures, shapes, and ridges making is easy to get a grip of the camera, even if it's wet. The grip is particularly effective on the front of the camera. On the back are a number of raised dots to give better grip for your thumb, and a large metal strap loop makes it easy to attach the wrist strap. The camera feels tough, as you would expect for a drop and crushproof camera. The buttons on the back of the camera are fairly close to each other, and if you have big clumsy hands then you may have some difficulty with them, but for the most part, there were no problems using the camera. Pressing the green button on the back brings up a shortcut screen, that lets you select four different options using the 4-way controller. The screen is a 2.7inch screen with a wide aspect ratio (16:9), so when shooting 4:3 aspect photos, there are large black borders on the left and right of the screen, meaning the image appears quite small. If you choose to shoot everything in 16:9 aspect ratio to make the most of the screen, then images are shot at 12 megapixels. Menus – The menus are quite easy to use, and when switching modes the camera gives a brief explanation of each mode. Built in help for the menu options would make the camera even easier to use. Battery life - Battery life is rated at 300 shots according to Ricoh / CIPA test results, which is good for a compact camera, although we would recommend a spare battery if you plan on shooting more. Speed - Shutter response, and focus speeds are quick, and shot to shot time is reasonably good. Continuous shooting at full resolution is slow at 1fps. To shoot at a higher continuous shooting speed, you have to switch to High-speed continuous shooting, with a reduced resolution of 5mp, and the camera will then shoot at roughly 15fps for almost 30 shots. The performance section is where we look at the image quality performance of the camera. Additional sample photos and product shots are available in the Equipment Database, where you can add your own review, photos and product ratings. Sample Photos - The camera has reliable exposure and will produce images with bright saturated colours in most situations. Portrait photos with flash often increase the ISO setting, and in this example using ISO1000 has created an image with very low detail and a blurry image with poor colour. D-Range settings let you select whether highlight and shadow correction is switched on. Lens Performance - Image quality is a little disappointing, with images appearing soft, particularly at the longer end of the zoom lens. Macro performance is a strength of the camera, and the 6 LEDs that surround the lens can help light the subject. Noise is visible at all ISO settings, although this won't be a problem if you avoid viewing images at 100%. The lack of image stabilisation and a fairly slow lens limits the camera's low light performance. Images should be suitable for sharing on social media websites, where the reduced resolution and bright colours will help. ISO Noise Performance - Noise is lowest at ISO125, although is still visible when viewing images at 100%. Detail is quite good at ISO125 and ISO200. Detail drops off at ISO400, as noise increases. For lower light situations ISO800 to ISO1600 may provide usable results, although noise increases and detail is reduced. At ISO3200 noise levels become strong and we would recommend avoiding this setting if possible, although results may still be useful if resized and used on the web. ISO6400 is best avoided as noise is high, and detail is very low. White Balance Performance - Auto White Balance (AWB) gives a warm colour cast under tungsten lighting, with the tungsten preset giving an accurate result. AWB performs very well under fluorescent lights, with the fluorescent preset giving a slightly warm result. Digital Filters - There are very few effects are available when shooting, although you can adjust the image tone, with a choice of bright, natural, vibrant, slide film and monochrome. There are a large number of effects available in playback mode. Options include Small face filter, Collage, HDR, Original frame, as well as further examples above. The camera doesn't feature a panoramic shooting mode. Video - The camera records Full HD video at 30fps or 1280x720 video at 60fps. Optical zoom is available while recording video. Slow motion video is also available, recording with a resolution of 1280x720, and a frame rate of 120fps. Care needs to be taken to ensure you hold the camera steady while recording video, as only electronic image stabilisation is available. 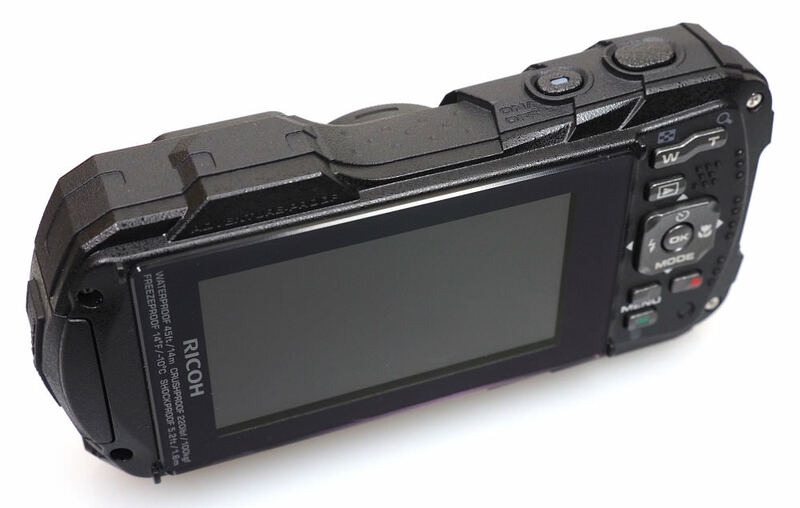 The Ricoh WG-50 is available for £249, which makes it quite expensive considering the features on offer, and the alternatives available. 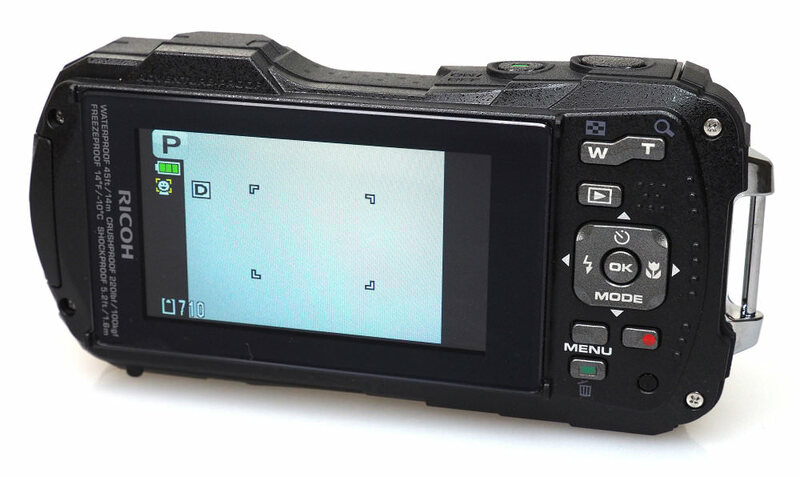 For example, the Fujifilm FinePix XP120 has the same or better specifications, plus built-in Wi-Fi, and is around £75-100 cheaper. If you have a bigger budget, then the Nikon Coolpix W300 and Olympus Tough TG-5 both offer 4K video recording, a brighter lens, plus built-in Wi-Fi and GPS. You'll also need to buy a memory card and a case or bag to keep your camera safe and protected - have a look at our complete guide to camera bags. Due to the price, and lack of built-in Wi-Fi, there's simply no reason to choose this camera over the Fujifilm FinePix XP120, unless you're someone who is allergic to Wi-Fi. The WG-50 has unique macro LED lights that surround the lens, which will help illuminate macro photos. The camera also gives good colour, and generally reliable exposure, however the lack of optical image stabilisation (OIS), along with soft images, makes it difficult to recommend this camera. The camera also struggles with noise and gives poor low light performance. For low-light, you'd be better off using a smartphone with a brighter aperture, and ideally OIS.